This was a short visit to Zimbabwe en route to Malawi via the Tete Corridor. The highlight had to be that we survived the rat-run corridor route without losing any money or the car! Back in Zim, another bridge toll, another insurance payment and within half an hour we were in a local transport cafe scoffing bacon and eggs. The journey to Harare was pretty long. 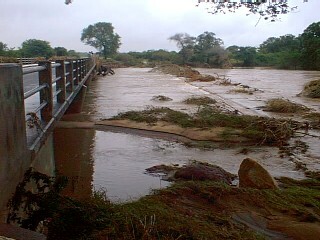 The rain had taken its toll on the area around the Bubi River. The previous week the water level was over the bridge. Local people had evacuated leaving their animals. Horses, ostriches and dogs had floated off. The car wasn't running as economically as before so our diesel level was lower than anticipated by the time we reached Harare. The jerry cans were full but this still wouldn't be enough to get us to the Mozambique border. Crisis - there was a fuel shortage in Zim. People were camping at fuel stations waiting for fuel deliveries. We were told various stories about delivery dates and that Mugabe was blaming the shortage on the tankers from Mozambique only being half full! Other reports suggested that he was providing fuel for troops in Angola. The next day we did a few jobs in town, including getting the transit visas for Mozambique sorted out. An email from Noel and Sally reported that they were in Tanzania with Gordon. Meanwhile Gordon was waiting for us. Hooray - a big Landy reunion perhaps! We went into a garage to ask for fuel and tyres. They initially said no to both until they were spied filling up their car with diesel. A stroke of luck - they felt embarrassed enough to fill ours up too. That night at The Rocks campsite Andrew changed the oil to GTX Magnetec - a previous favourite of Pundas. That evening we got very excited after talking to some overland truck drivers who reported the opening of Sudan to tourists. People are starting to get through and one overland truck had just left Cape Town en route to Cairo. We decided that if we could get the paperwork sorted out we would drive home, perhaps in convoy with Comet and Turtle. In the morning a visit to the Sudanese, Egyptian and Ethiopian Embassies proved positive as did preliminary investigations into extending our paperwork. We were almost bursting with excitement and were eager to hear more news of peoples travels through Sudan. That night we were chatting to the truckers again until 3am finding out as much as possible about Tanzania and Kenya. On Wednesday 1st we left Harare feeling a bit miffed at having had to pay our first bribe to get a spare part for the stereo. It was a case of "you can have the bit if you pay a one hour labour charge (£10)" or "you could give me a fiver". Leaving Harare we were soon on the road to Mozambique through the infamous Tete Corridor. We had heard lots of stories about car-jackings and hold-ups along this rat-run route to Malawi. We had our tactics planned - don't stop, and if in doubt, run 'em over! Fortunately we had been studying Portuguese tapes lent to us by Auntie Kath and Uncle David. What a difficult language to learn but we mastered the greetings and impressed the border officials. The fact that they spoke brilliant English was irrelevant of course! Arriving in a foreign speaking country was a little unnerving and we soon fell into the tourist tax trap. 5 US$ (£3) per person. What they did not tell us was that we could have paid 10 rand (£1) or 50 Zim$ (90p). Then there was the temporary import document fee as they do not accept carnets and then there was the insurance of a tenna. All for a 200 km transit. Soon we were into the land of the potholes. Oh, terrible. Huge things that you drop into and bounce out of if you are lucky. Some are filled in which leads you to falsely believe that the next set may be filled in too. We were told that there were police blocks everywhere along this route so we emptied the purse so that it had only a few penny equivalents in it. If we were stopped we could plead poverty, particularly as we were only transiting through. Our first and only block was by a group of locals who had filled in a big pot hole then placed boulders over the top. The idea was to force you to stop so they could remove a couple of boulders for you as you were digging into your wallet and paying for the privilege of having the hole filled in. Not us - we weren't stopping for anyone. The boulders were quite small so we drove over them and waved to the chaps as they hurled abuse at us. The potholes continued but fortunately we caught up with a truck weaving through them so we tailgated him for an hour. It was great, dashing through and missing all the holes. We didn't make enough progress to make it through the Malawi border before it shut so we decided to camp at a motel type place "La Piscina" under the Tete Bridge. The anticipated swimming pool (our interpretation of piscina) looked more like a pond. The menu gave us an opportunity to test our Portuguese and the loud music tested our eardrums. Camping in car parks is never much fun. In the morning we were on the road again and somehow managed to avoid the toll fee for the Tete bridge, which apparently depends on how stupid you are and how much cash you have in your wallet. We were a little apprehensive about any road blocks ahead and wondered how long our luck would hold out for. No problem. Everyone was pleasant, no blocks and we were soon through to Malawi. Top tips for the Tete Corridor. We enjoyed the experience of staying at the Piscina as we could interact with the locals and have a laugh with the lingo. However crossing the Tete Corridor is renowned for its armed hold-ups, particularly of independent travellers in their own cars. I would recommend that you make an early start and get through the corridor and into Malawi in a day, perhaps aiming for the exit border near to the 6pm closing time when the officials are eager to sign you out so they can go home. don't stop if you can help it. The remainder of Mozambique is apparently fantastic. The rains in the south, the harsh roads in the north (need 2 cars) and the desire to get to Tanzania to meet Gordon quickly prevented us from spending time here. Everyone we have spoken to, including Noel and Sally absolutely loved the country. Just keep to the roads. Landmines are everywhere and previously 'clear' areas are no longer clear because the rains have shifted the mines. We later heard that Richard and Jane who we had met in South Africa in September had been held up along the route and paid £160 for the privilege of being let-off.